After many visits to France, the first when I was 22, I had never been to this legendary Gothic cathedral south of Paris. I remember Kenneth Clarke in "Civilization" describing it as the most beautiful building in Europe. Dan Cruickshank said something similar, and so did people like Orson Wells and Marcel Proust. 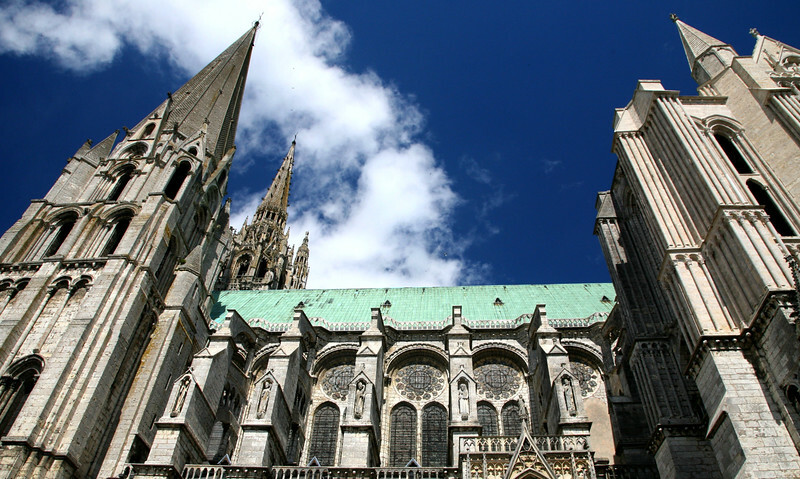 Friends came back from France telling me that Chartres was worth a visit. Several years ago I started planning a trip, and finally got there last May. I took the 45-minute train south from Paris through the French countryside and found a little hotel and bistro next to the north tower. The cathedral was everything they said it was, although scaffolding spoiled my photos and covered up the famous rose window and sculpture on the facade. At 5pm the day-trippers went back to Paris and I had the town to myself. Sitting alone in the central nave, beneath 800-year-old stained glass and soaring walls, I thought about the centuries of wars and revolutions this antique building had survived. I walked around the cathedral after dark, lit up with orange spotlights under the stars. I climbed the north tower in the morning, looking out over the city far below. I could see a medieval town hall in the distance, and the railroad viaduct coming in across the distant fields from Paris. Carvings in the doorways depicted Abraham, Issac, Jesus, Mary, Joseph, John, Matthew, Peter, Judas and King David, and hundreds of Bible figures I didn't know. Their faces were repeated in the colored windows inside, bordered by the famous Chartres blue glass. I am not a religious person, but Chartres was clearly inspired by an extraordinary man, and the result is one of the grandest buildings in the world. Cathedrale Notre Dame de Chartres.